This course is flat. There are 36 holes in total, the Classic Course and the Masters Course that the professional tournaments are often held on. The Classic Course has gentler mounds, fewer water hazards and is shorter, so it is easier. It emphases the all-important approach shots as the greens are strategically guarded. The official course rating is 73.4 and the official length is 7164 yards but players are not allowed to play from the pro tees except for professional tournaments. So the overall length is reduced to 6693 yards and the course rating drops to 71.2, which, I am afraid, does not satisfy advanced players. However, there are many very long fairway bunkers that are used as the substitutes of creeks, which are peculiar to the Pete Dye design and help to make the course make the course more challenging. The 12th and 13th holes are very impressive layouts making good use of rivers. A slight dogleg to the left with a lake on the right and OB on the left. An accurate second shot is needed as there is a lake on the left of the green and a 3 –meter (10 ft.) bunker in front of the green. A long par 5 with bunkers extending along most of the right side of the fairway. The bunker guarding the right side and back of the green is 3 meters (10 ft.) deep. A dogleg to the left. The left side of the fairway and green are facing water. The fairway is relatively tight. A par 5 with a lake on the right of the hole. The bunkers and water hazards are strategically placed. A dogleg to the right. The tee shot is over a river and the fairway bunkers are as long as 200 yards adjacent to the river. The green is 44 yards deep, and shaped like a horse’s back. A slight dogleg to the right, a great par 4. The tee shot is over a river and the right side of the hole borders the same river. The green has complex undulations and bunkers on both sides come into play. The trees around the green are neatly placed. In 2000, this hole was selected as one of the best 500 holes in the world by US Golf Magazine. A par 3 with an elevated, undulating and 50 yards long green. When you hit the green away from the pin, a very demanding putt remains. A long par 4 dogleg to the right. The left of the fairway faces water. The approach shot must be precise because there is water on the right side of the green and a bunker on the left. It takes 10 minutes from Singapore Airport by taxi. There are golf carts equipped with rain covers, the first time I had seen them. When I played, there was a rainsquall and the rain cover was very handy. 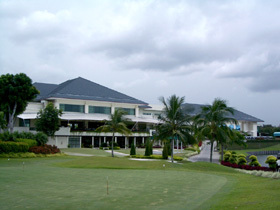 The clubhouse has a comfortable open-air restaurant with a Japanese style bath and a sauna. I had an opportunity to take a look at the rooms in the hotel next to the clubhouse and they were excellent. It seems that the swimming pool and beauty salon have good reputations. The works of Pete Dye, Andy Dye or Dye Design Inc. in Asia are as follows: West Coast GC in China, Khao Kheow CC, Subhapruek CC, Thai Muang Beach G&M, The Kao Cha-Ngok G&CC in Thailand, Woo Jeong Hills CC, Castlex GC in Korea, Orna G&CC, Poresia CC in Malaysia, Eagle Ridge G&CC - Andy Dye Course in the Philippines , and St. Lakes GC, Maple Point GC, Kannami Springs CC, White Bachi CC, Golden Lakes CC, Olympics Staff – Toga Course, Village Club – Taiko Course, The CC Glenmoore, Iwase Royal GC – Iwase Course, Kimisarazu GL, Mission Hills CC, Sapporo Bay GC in Japan.